Grindelwalddave wrote: ...there was commentary on social media that the decline in forestry activity was to blame for these fires. Plenty of cleared coupes plantation and otherwise in the Riveaux Road fire. The science shows that forestry activity - especially clearfelling and monoculture eucalyptus or pine plantations - increase the fire risk. One more thing that you cannot teach people who are determined not to learn. Warin wrote: For how many 100's of years have we been having fires in Tasmania, and just now the fires are due to climate change? Climate change has been moving up on us. A little more each year, but getting a larger change each year. Some data from some other islands ..
"The island is in the grip of a drought, the worst in many years according to many people," Norfolk Island Mayor Robin Adams said. Bureau of Meteorology Norfolk Island station officer, Adam Jauczius said there had been an "incredible influx of dry years" over the past 40 years. "The general trend is indicating that we are getting a declining rainfall,"
In 2018 Lord Howe Island endured its driest year in 132 years, receiving about 500mm less rainfall than the average. Mt Anne / Eliza Plateau certainly had a close call, *&%$#! fire creeping up the ridge lines. Does anybody know how High Camp hut fared? Rabid K9 wrote: Does anybody know how High Camp hut fared? They also have updates on specific areas - last one on 10/2, but some earlier updates are still relevant. "The majority of the burned area is comprised of flammable vegetation communities. Fires in the west of the state (Gell River, Southwest, West Coast) have burned large tracts of sedgeland and buttongrass moorland (45-75% of burned area; Figure 2), whilst the Riveaux-Pedder fire complex is dominated by wet eucalypt communities (50% of burned area). 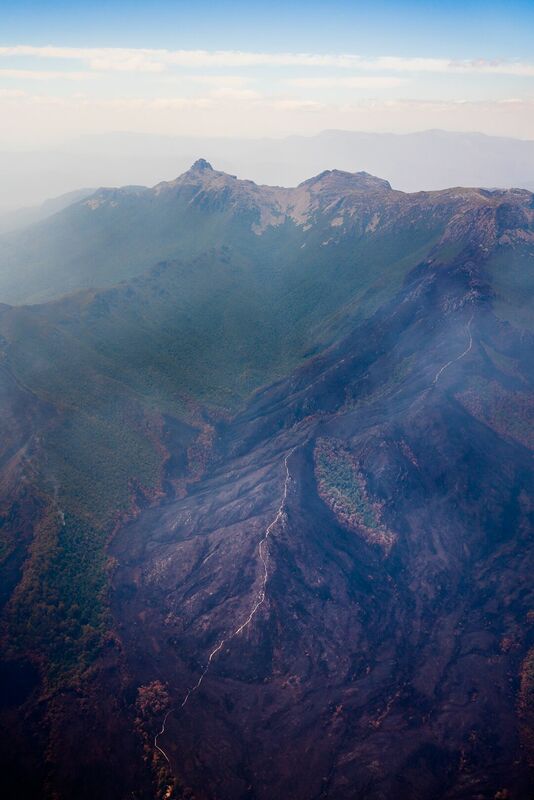 The Central Plateau fire consists largely of dry eucalypt forest (65% of burned area). These vegetation communities have an ecology based on frequent (e.g. moorland and scrub) or infrequent fires (e.g. wet eucalypt) and consist of plant species with a range of adaptions to fire. We expect these vegetation communities should successfully recover over time." As they have done in the past. With climate change however, the more frequent and intense fires will result in changes to the distribution or even the extinction of communities in heavily impacted areas. It is probable that areas such as Mt Bobs will remain as refuges for the communities observed there... but we are really heading into unchartered territory. More frequent - and more intense - fires in the sedge/heath communities means an eventual loss of the peat soils that support them, as the peat itself is flammable. One particular fire on the west coast only stopped because it reached an area that had been burnt to bedrock fairly recently. As that excerpt says "...recover over time". That means long enough without another fire of similar (or greater) intensity. And with our changing climate, the likelihood of that is remote. north-north-west wrote: More frequent - and more intense - fires in the sedge/heath communities means an eventual loss of the peat soils that support them, as the peat itself is flammable. Yes. The peat and soils will also be exposed to erosion from rainfall for the period following fire until the vegetation recovers. Prescribed burns have the same impact as they target ground cover. Excellent. I'll take snow to put out the fires. Has anyone got an update on access to Western Arthurs, or the best places to keep an eye on for info - have a trip to Oberon and back planned there for the end of March. - have been keeping an eye on MAPS/ Tas Fire/TasAlert/Sentinel Hotspot for areas that have burnt/remain burning??? Keep an eye on this page, I reckon. Yep, thanks as I mentioned in my post I'm logically keeping an eye on all the publicly available info with the hope that the Parks/Roads will reopen soon. - whether there is still any ongoing activity nearby...? Moonlight Ridge should be re-opened today. That's good. Not that it's on my hit list, but things are slowly getting back to normal. Scotts Peak Rd is frustrating. Wanted to do the Port Davey Track - which had no fire activity - but can't get in there. Grrrrr! You couldn't walk in on the Yo-Yo to get to the Port Davey, NNW ? Yoyo was badly affected by the fires too. All tracks south of geeveston remain closed. Thanks heaps, exactly what I was after (I do also plan to call Parks closer to the date). Blue Jacket Hiker wrote: (I do also plan to call Parks closer to the date). What's this gonna achieve that you can't find out online? If we're starting to cut it fine (track still not opened a week out), I'll call them to try and find out the likelihood of it opening sooner rather than later - they may not be able to tell me anything but proximity of re-opening isn't something they usually post online...but may tell regarding specific enquiries. But I'll let you know if anything. I find it interesting that after the devastating fires on the East Coast at Scammander some recent years ago, the TFS / Govt brainstormed the issues to apparently learn better outcomes with response, resources, personell, infrastructure, machinery, etc, etc. The recent fires situation makes me wonder !!! I was hoping so too, unfortunately still no change. I have spoken with SWNP as well as a mate in Parks who both said reopening of the Western Arthurs was unlikely before the end of March. I also enquired whether any "special permission" could be obtained by registering a set walk that for example only went to areas that could be deemed safe (unburnt and out of harms way) but no avenue there. So our long planned trip to Lake Oberon as our first foray is on hold for now (as many Arthurs trips have been in the past). We're heading to the Walls instead and hoping to have a decent reccy for a winter snow trip later in the year.